West Indies 213 (Shivnarine Chanderpaul 76, Darren Bravo 40, Tim Southe 4-52, Trent Boult 3-40) and 2-168 (Bravo 72*, Kirk Edwards 59, Trent Boult 1-26) trails New Zealand 9-609 declared (Ross Taylor 217*, Brendon McCullum 113, Tino Best 3-148) by 228 runs with eight wickets in hand. The Black Caps powered 609 for the loss of 9 wickets in the first innings. The Windies were bowled out for 213 mere runs in their first innings followed by 2-168 in the second. The third day’s play concluded on Thursday, December 5, 2013, at University Oval, Dunedin. Earlier, the visitors commenced their first innings at 2-67 whereas Darren Bravo and Marlon Samuels were at the wicket for 37 and 14 runs. The duo left the scene after the addition of just six runs to the overnight score as the experienced, Shivnarine Chanderpaul along with Narsingh Deonarine tried to stabilise the innings. 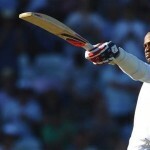 They took the score to 106 when the latter was gone for 15 as Chanderpaul kept on enhancing at the other end with little assistance from the other side. 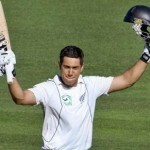 He completed his 11000 runs in Test cricket with a four and reached his 62nd Test fifty in the 49th over with 3 fours. The 39-year-old was finally declared leg before wicket off Trent Boult for 76, Darren Sammy secured his end for 27 and the innings of the entire Caribbeans team was folded back for 213 in 62.1 overs. 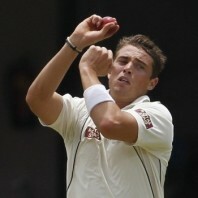 Tim Southee was the supreme bowler with four wickets, Trent Boult held three and Ish Sodhi got two wickets. The Kiwis forced a follow on and West Indies started their second innings with a deficit of 396 runs with an early blow by losing their first wicket for 18. Darren Bravo joined in with Kirk Edwards and they started the repair work with passion and the first attained his 9th Test half century in the 28th over. Edwards followed him with his fifth Test fifty six overs later and the partnership came to an end at 135 when he was held lbw off Sodhi for 59. Darren Bravo and Marlon Samuels were unbeaten for 72 and 17 as the tourists managed 168 for the loss of two wickets in 49 overs. West Indies lacks behind 228 runs and the hosts, New Zealand, has a bright chance of winning the game.